Predictive analytics is on the verge of widespread adoption as enterprises become more interested in deploying predictive capabilities. In fact, a recent 2017 TDWI education survey, ranked predictive analytics the top analytics-related topic respondents wanted to learn about. 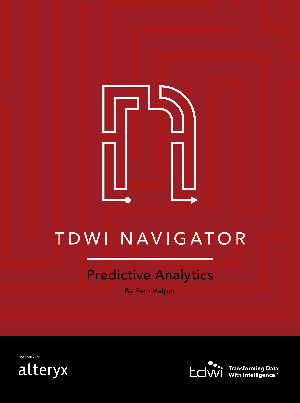 The TDWI Navigator Report- Predictive Analytics provides a comprehensive overview of the state of the predictive analytics market. Download this report today to get a better sense on how your organization can take advantage of predictive analytics to drive change in your business.